For those who have golfed with me over the years this will come as no surprise. One of the things I really enjoy is either changing out my entire set of clubs, or at least of few of the clubs in my set with great frequency. Why you may ask? When you play as much golf as I do you need to do things that stimulate continued interest and concentration and changing clubs does that for me. As well, there are times when I configure my set in keeping with the course that I will be playing. For example, if I’m playing at Wildewood, which is a relatively short (6048 yards) course that has a lot of trees and ball positioning off the tee is of prime importance, I might opt for a low lofted (13 degree) 3 wood to use for tee shots on some of the shorter and narrow par 4’s. I might also remove one of the longer hybrids and substitute an additional wedge. At times I will even remove my regular driver from the bag and use a 12 degree ‘mini driver’ for accuracy purposes. When playing a longer course such as Bridges where distance is more important and lack of accuracy is not as severely punished I might again remove my regular driver and replace it with a longer driver with an overall length of 47 and 7/8 inches to add distance off the tee. I might also pull out one of the wedges and add a low lofted (17 degree) hybrid. Other times I might simply swap out my entire set of irons either just for a change or to compensate for some temporary anomaly in my swing. If for example I go through a phase where I’m drawing my irons I may use a set of forward progressed irons that tend to promote a slight fade, or conversely if I’m fading the ball I made used a set of irons with a slight offset to promote a straighter ball flight. At times my swing may get out of whack and if I find I’m hitting a lot of fat (club makes contact with the ground behind the ball) shots or when the course conditions are wet and sloppy I’ll revert back to a set of irons that consist entirely of hybrids. On other days when I’m just feeling adventurous I may bring out a set of irons that are all the same length, with heads that all have the same weight. This type of club allows you to position the ball identically for each club as the only thing that changes from club to club is the loft angle. This means you are able to use exactly the same swing with each club. 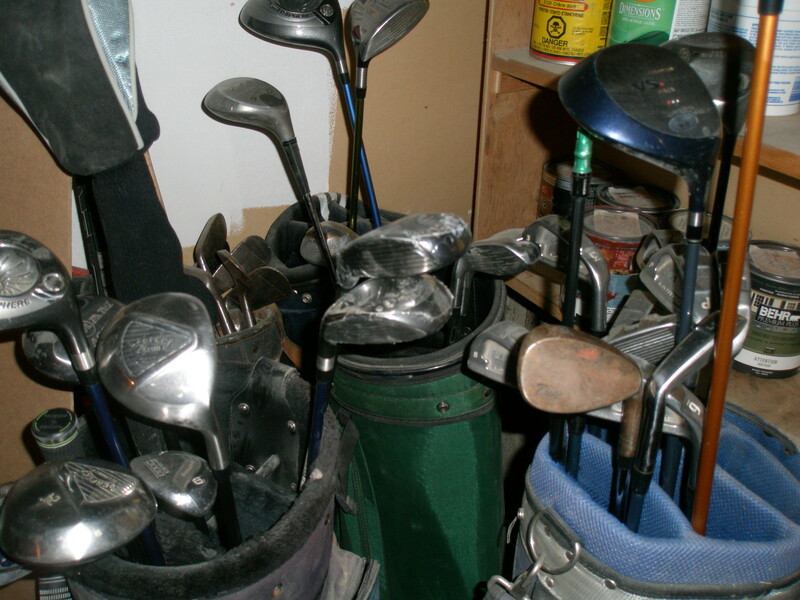 So how many sets of clubs to I have, well right now I have 5 sets of irons and an assortment of drivers an fairway wood in different combinations of loft and shaft length, a descent collection of hybrids in different lofts, an assortment of wedges and a few putters. This array of clubs allows me to configure different set of clubs to suit my game, the course I’m playing or just the mood I happen to be in. Nice to see your new blog on a topic you know so much about!!! Not sure you will remember golfing in the Communications Division staff day way back about 12 years ago… You were on my foursome and we did not want to win..just get free golf lessons from you and watch you do those trick shots of yours??? Anyway my golfing is only slightly better now than back then…so still pretty bad…. But now we have a winter place on a golf course mostly because you showed me how much fun this game can if you adopt the correct mental approach. So now I have four sets of clubs…two in Canada and two in Arizona!!! Keep writing…you( still) do great work. I remember that golf outing. Glad to see you are enjoying the game, and in Arizona in the winter. Beats my visits to the dome.